An Atlas rocket launches into orbit. It's one completed, 14 flights to go this year for United Launch Alliance and its fleet of Atlas and Delta rocket families. "This year we have a very busy manifest in 2014," said Vern Thorp, ULA's manager of NASA missions. The year began successfully Thursday night as an Atlas 5 deployed the 7,600-pound Tracking and Data Relay Satellite for NASA from Cape Canaveral. The flight began on the scheduled date, extending the string of Atlas launches to 10 that have gone on the first attempt. Next up is the Delta 4 rocket and its Global Positioning System 2F-5 navigation satellite for the U.S. Air Force on Feb. 20 from the Cape. That booster is on the pad awaiting attachment of the spacecraft for the evening time liftoff. The next Atlas is planned for March 25 on the NROL-67 mission for the U.S. National Reconnaissance Office. The rocket is carrying a clandestine spy satellite for national security use from the Cape. 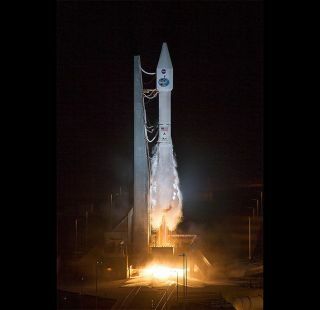 The year's first space launch from Vandenberg Air Force Base in California comes on April 3 with the flight of an Atlas 5 carrying the Defense Meteorological Satellite Program weather observatory for the Air Force. A pair of flights are planned in May — one Atlas, one Delta 4 — from the Cape. The Atlas will launch NROL-33 for the National Reconnaissance Office. The Delta will carry GPS 2F-6 into orbit. The return of the Delta 2 rocket, the medium-class workhorse for a quarter-century, comes after a two-year hiatus. The Vandenberg launch will launch the Orbiting Carbon Observatory for NASA on July 1. July also sees an Atlas provide lift for GPS 2F-7 as the surge of navigation satellites to replenish the constellation goes forward. And at mid-year, the commercial Worldview 3 Earth-imaging satellite will be launched from Vandenberg atop an Atlas. Then comes the secretive CLIO satellite from the Cape on an Atlas. Little is known about the spacecraft or its mission. Undoubtedly a highlight of the year occurs in September with the Orion test flight. A Delta 4-Heavy rocket to launch NASA's Orion capsule on a high-altitude orbital shakedown cruise before re-entering the atmosphere and splashing down in the Pacific Ocean for recovery. The launch window opens Sept. 18. The second Delta 2 of the year is planned for November with the Soil Moisture Active Passive (SMAP) Earth-observing satellite from the West Coast. Atlas performs a Thanksgiving-time launch of NASA's Magnetospheric Multiscale Mission, a four-satellite project launching one a single rocket to study magnetospheric boundary regions. The final Delta 4 of the year is also a classified mission from the Cape. It will ascend to geosynchronous orbit, the Air Force confirms, with the AFSPC-4 payload for Space Command. There's also a year-end Atlas 5 with NROL-35 for the National Reconnaissance Office from California.